Posted on October 26, 2016 by Nellie Jacobs: Creative Consultant/Coach providing inspiration, motivation, focus and strategies to individuals and groups. Tagged dialysisdonorKidneykidney foundation of canadaliving organ donor registryorgan donationorgandonorswimThe Canadian Society of Transplantationthe Startransplant	Comments3 Comments on Should individuals campaign for their own organ donors? Should individuals campaign for their own organ donors? I can’t believe that is even a question. This is not a matter of rich and cute; the media chooses who to feature. Desperate people do desperate things to continue living, including posting signs on placards, cars, and billboards, and flying to other countries for purchased kidneys. Here’s a brief outline of my family’s story. In 2010, my husband’s kidneys suddenly failed. Not one to ask others to do what I can myself, I went through 11 months of tests and was approved to donate my kidney to my husband. Two and a half years later, a rare reaction to the polyomavirus slowly attacked the kidney, and in January of this year my husband once again began undergoing four to five hour long hospital dialysis treatments three times a week. We composed a letter outlining our situation, what it means to be a living donor, who to reach for more information, and a request to sign our petition. We circulated the letter among our personal and social media networks, and to media outlets. We created a Facebook page and Twitter hashtags. Partnering with the Kidney Foundation of Canada, after seven months of intensive planning, we initiated a 30 kilometre six person – including a female Olympic hopeful – relay swim across Lake Muskoka on July 30th this year. It was a remarkable day with remarkable volunteers, many of whom arrived as strangers to us. Not only did the swim raise awareness about organ donation through media coverage, it raised enough monies through donations to send 10 (!!!) children with kidney issues to a week at summer camp:. BTW: This past Thursday, my husband was completely unexpectedly notified of a matching kidney from a deceased donor available for him. We prayed for the grieving family, and then hurried down to the hospital; he underwent a series of tests to evaluate his suitability; he stayed overnight, enduring more tests; our kids gathered in the morning. On Friday, just an hour before the scheduled surgery, we were told the potential donated kidney was unfortunately compromised. Two liver and two kidney surgeries were cancelled. We returned home to continue our campaign—for ourselves, and for others. The Star article was based on results of a current paper released by The Canadian Society of Transplantation. If you haven’t already signed your organ card, please consider doing so. Your donation can save or enhance eight lives. Click here for more information about making donation part of your legacy plan. 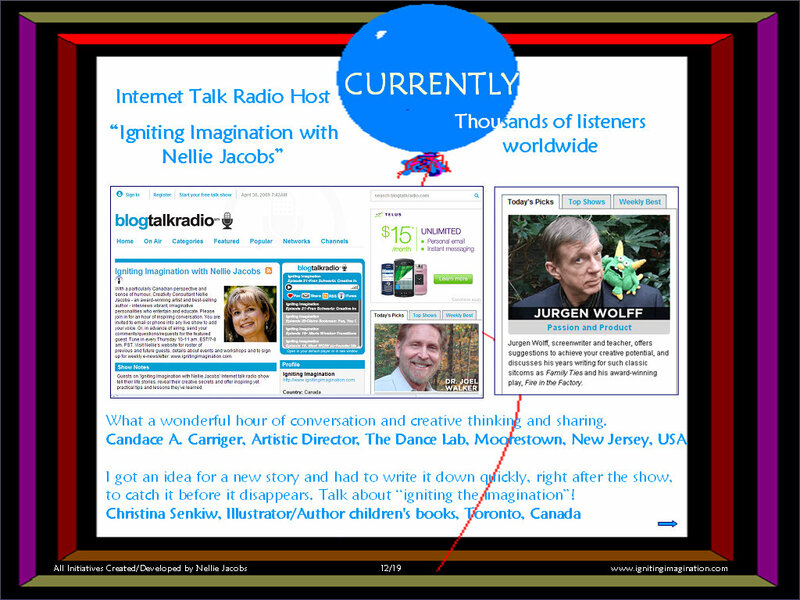 Igniting Imagination with Nellie Jacobs Internet talk radio show is now celebrating 10, 600 listeners …and growing more than one hundred listeners a week! Take the Listener Challenge! Click here for details and stat updates. On Tuesday, I checked the printer’s proof of Making Opportunity Knock, and it’s a go! The book will be shipped to the warehouse book distribution centre in the next two weeks. As part of my marketing plan, I have taken considerable time and re-writes to develop two letters. 2. Click here to download/print “Mining Your Resources” bookmarks to use/distribute. I ask friends and relatives in my network to forward that email to their networks. With such venerable institutions such as book distributor H B Fenn—Canada’s largest independently owned book distributor—and publishing house Key Porter shutting down, and Borders filing for Chapter 11 in the United States (effectively closing about a third of its 674 retail bookstores), what future does an author face? “The publishing world is definitely experiencing an upheaval,” says best-selling author Nellie Jacobs, a former Newsletter Chair of the Writers Union of Canada. Jacobs believes that these events in the publishing industry reflect what is happening in other fields around the world. Yet, she says, these devastating changes can be blessings in disguise. Jacobs concludes that because so much is unpredictable and unknown today, there is no one expert who can tell you the right thing to do or path to follow. Everything is in flux. It’s all about transformation, rejuvenation—and making opportunity knock. Jacobs knows about such things. During most of 2010 she underwent tests and appointments in preparation to donate her kidney. To calm anxiety about the upcoming surgery, she immersed herself in a frenzy of creative activity. 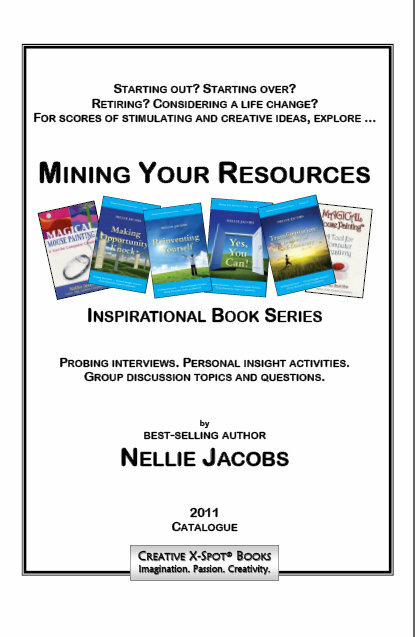 One outcome is the upcoming “Mining Your Resources” series of books she is proudly self-publishing. Click here to download 12-page 2011 full colour catalogue. Studies indicate that “52 percent of all books are not sold in bookstores.” In considering what marketing and market opportunities might be available, Jacobs says she was motivated by the individuals who generously shared their personal stories and lessons learned in interviews for her inspirational, self-help series. Determined to follow their entrepreneurial spirit, she decided to market the series’ first book in new ways, starting at a grass roots level. While approaching Canada-wide non-traditional retailers in addition to traditional bookstores, Jacobs expects to market with book signings/talks through home parties, book clubs, study groups, businesses, schools and organizations as well as offering online presentations and interviews. She’s taking advantage of social media networks. To spread the word and reach listeners—and potential readers—worldwide, beginning in mid-March she will be co-hosting a “How Have You Made Opportunity Knock?” phone-in series on her Internet talk radio show. She is also chronicling her self-publishing journey on a blog. Continually mining her own resources, Jacobs is an award-winning artist who has designed her own business cards, bookmarks*, 12-page full colour 2011 book catalogue, and website. 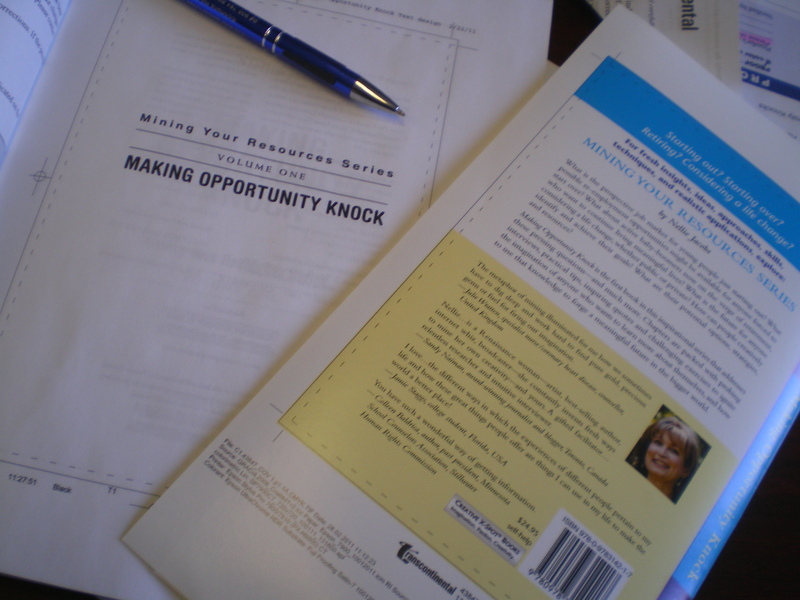 March 21, 2011 is publication date of Making Opportunity Knock, volume one in the “Mining Your Resources” book and workshop series developed by Nellie Jacobs. For more details, visit www.nelliejacobs.com. A portion of proceeds from these books will be donated to Toronto General & Western Hospital Foundation to support ongoing research for the Kidney Transplant Program at Toronto General Hospital. You are welcome to make comments.